Mathemaesthetics was founded in 1988 by Doug McKenna, a computer programmer and mathematical artist who delights in recursive geometries. In addition to his work as a software developer--itself a form of mathematical art--McKenna has for nearly 30 years created works in his chosen medium of fractal tile designs, space-filling curves, and other recursive or self-referential geometries. These constructions would have been impossible to accurately create before the computer age. McKenna is a pioneer in recursive designs. He began creating geometric fractal art in 1977, on early, low-resolution bitmap displays at Yale University. In 1978, he began drawing geometric fractals on a computer-controlled pen plotter using his own custom software and drivers. Prior to the advent of commonly available algorithms for coloring and filling arbitrary complex areas, McKenna would then painstakingly color his fractal designs by hand, with a nib pen and India ink (for which only a razor blade worked as an "eraser"!). As a result of his growing portfolio of illustrations, constructions, as well as his discovery of a fundamental space-filling curve construction, during 1980-81 McKenna hired on at IBM Research as one of Prof. Benoit Mandelbrot's two full-time computer graphics illustrators, where he designed and coded many high-resolution pictures of geometric fractals for Mandelbrot's influential treatise, The Fractal Geometry of Nature . The book contains ten black & white Plates by McKenna (see p. 444 for partial list), and dozens of smaller illustrations visually explaining the geometric etymologies of the larger constructions Mandelbrot used to illustrate fractal fundamentals. These illustrations were created on experimental IBM phototypesetting equipment of the day, often pushing the computer graphics software of that time to its limits. McKenna went on to have one of the very first fractal art shows in 1981, at the Capitol Children's Museum in Washington, DC. Several of his Dragon Curve variations appeared in Smithsonian Magazine's first 1983 article on fractals. In 1984, he had a successful one-person show, entitled "Mathemaesthetics", on Boston's Newbury Street. Yale University's first fractal art show (1985) featured several dozen of McKenna's early "plottery". During the 1990s, McKenna concentrated on selling Mathemaesthetics' Resorcerer and other software products. With the advent of personal computers running at speeds 1000 times faster than in the late 1970s, McKenna's 20-year quest to enumerate square-filling Peano Curve constructions hit paydirt when in 1998 he successfully enumerated over 20 million new space-filling recursive tile designs. This opened up a visually rich combinatoric space which McKenna is currently exploring for aesthetically or algorithmically interesting designs. Computer graphics pioneer Ken Knowlton recently rendered McKenna's visage with a self-referential portait, drawn using a single space-filling line based on the unique Order 5 "E" Curve McKenna discovered via an exhaustive search in 1978. Mathemaesthetics, Inc. is pleased to make available some of McKenna's unique mathemaesthetic works. Each piece is a large, limited edition Giclée print. The Giclée process has come a long way in the last decade. Giclées are created using archival quality inks and fine-art, acid-free paper, printed individually at very high resolution (unlike the low-resolution web samples here on your computer screen). Giclées are the basis of a thriving web-based market for artists to sell directly to their customers. Each print is signed and numbered by the artist, or in McKenna's case, the artist-discoverer. These prints make fantastic gifts for any mathematically or visually minded person. They are also a great way to initiate math or computer science students into the wonders of recursive thinking. © 2006 Douglas McKenna. All rights reserved. 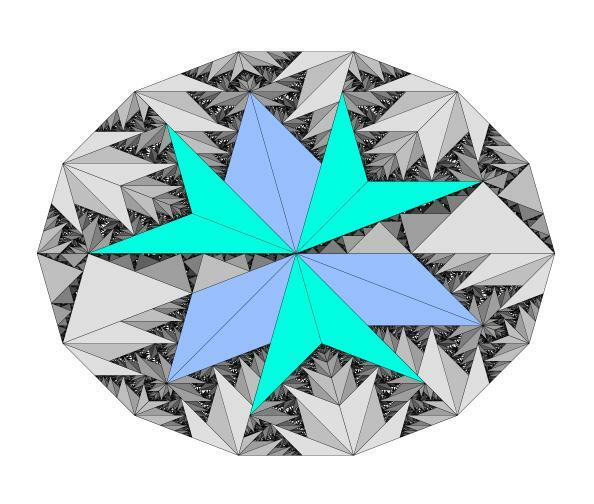 Fleur d’Ellipse is a fanciful recursive geometric design that is based on heptagonal subdivisions, arranged elliptically in such a way as to seem almost flowerlike, and not quite symmetric. First drawn in the early 1980's as a pen-plotter drawing, Fleur d’Ellipse contains both bold and delicate details, arranged in ways that use tilings based on the silver ratio in an almost fern-like fractal texture. See magnified detail here. © 2011 Douglas McKenna. All rights reserved. Interruption has an underlying combinatoric structure based on a newly discovered family of space-filling curve generators. © 2005 Douglas McKenna. All rights reserved. Peano Quartet is one of McKenna's most visually intriguing works. Based on a fundamental self-similar, space-filling, tiling construction he discovered in 2004, the piece is composed of a simple, diagonal motif repeated at different scales and orientations, mixing foreground with background, according to its own structure. The work captures one's visual imagination as it subdivides a square into what initially appear to be four similar or identical parts, but are not. There are optical illusion qualities to it as well. One's eye is fooled into seeing parallel horizontal features as not parallel. The piece evinces the all-important tension between symmetry and asymmetry that McKenna feels is the hallmark of all successful mathematical art. Platonic Dance is, like Peano Quartet, based on a repeated, simple diagonal geometric motif in different sizes and with strong symmetrical and asymmetrical arrangements, reflecting a deep self-referential structure within the square. Given the completely different visual feel of this piece compared to the Peano Quartet above, it is remarkable that both pieces can be dissected into the exact same set of small square tiles. Blade Rainer is, like the above two, another in McKenna's B&W explorations of self-referential, space-filling patterns within the square. The imagery here arises out of basic combinatorial constraints within the square and has tremendously strong vertical elements. This piece is far more stark and foreboding to the eye, with intimations of both skating blades on the right, and bands of razor blades internally. Pla(te Tec)tonic Dance displays a strong tension between the binary subdvision of the square (one set of fault lines) and the myriad diagonal elements that suffuse the image everywhere. It is one of several related variations, the others of which are named Platonic Dances. It appears almost as an abstract representation of horizontal sedimentary deposition over a different angled layer of fractured (and fractal!) rock. © 2007 Douglas McKenna. All rights reserved. Golden Gnomon is a new, more accurately drawn version of a pen plotter drawing McKenna first made back in 1985. 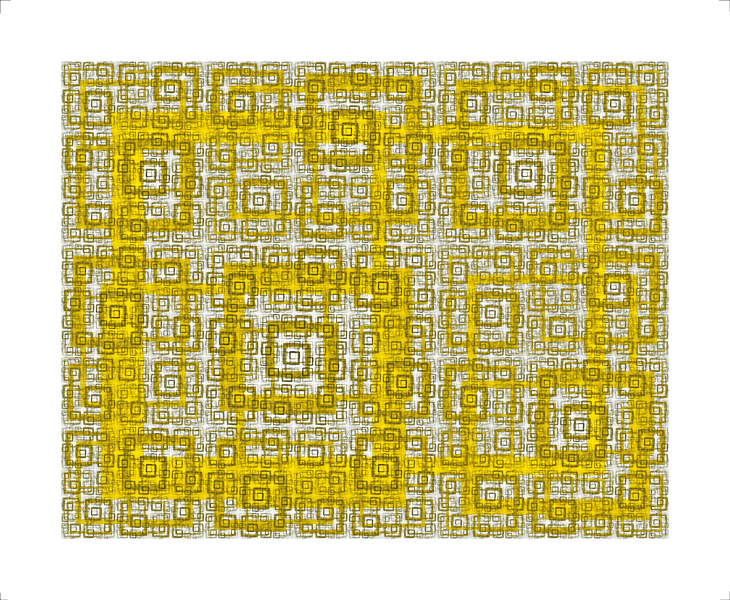 It is based on a non-periodic Ammann tiling, which is in turn based on even and odd powers of the square root of the golden ratio. Not surprisingly, one can even find the Fibonacci numbers hidden in the design. 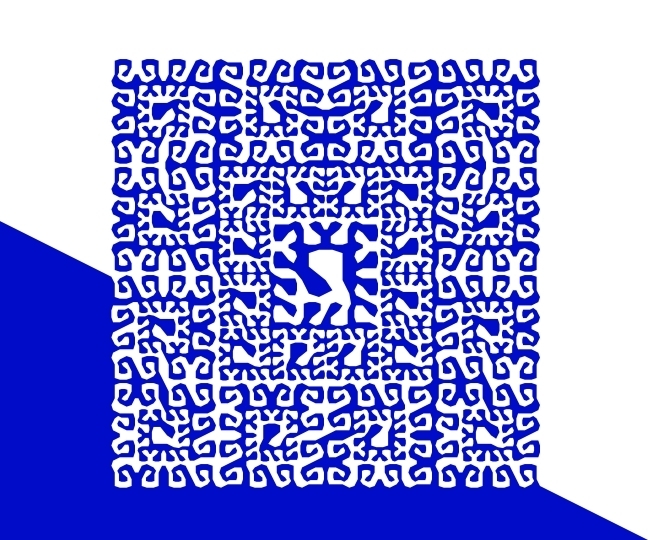 Thirteenski is a base-13-based fractal space-filling curve that McKenna recently discovered. This self-avoiding variation, with multiple scales, again exhibits a fascinating tension between symmetry and asymmetry, with an almost African art quality to it. The name Thirteenski is a reference to the mathematician Sierpinski, whose "Carpet" construction this abstract design "threads". © 2008 Douglas McKenna. All rights reserved. Synaptica is a simple tile design, using square tiles of two colors, that is self-negative: if you rotate it by 180 degrees, black and white tiles swap. The same is true for the component design repeated throughout. 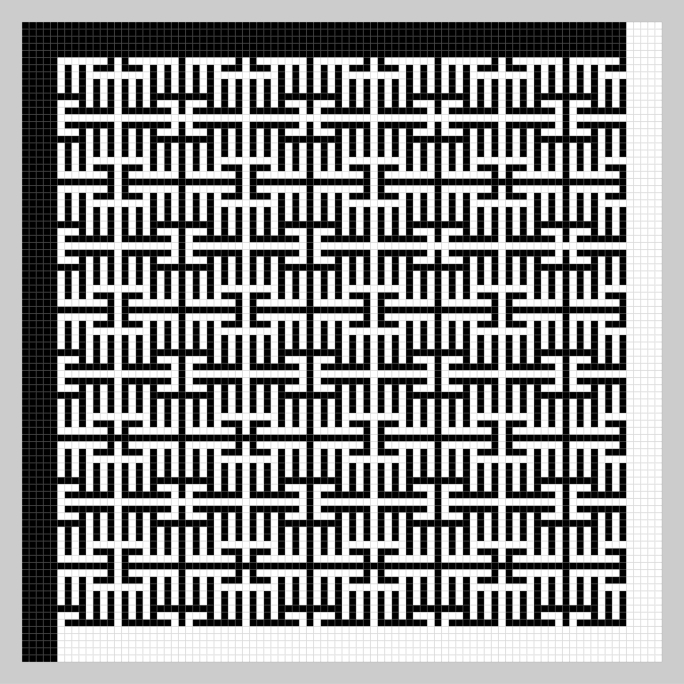 This design is based upon a generalized Peano curve: the border between black and white tiles is a simple continuous path. And the foreground and background have the same shape. 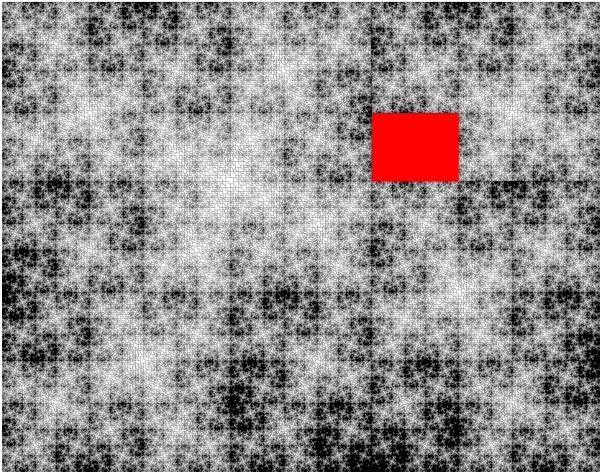 While the tiling pattern appears periodic, it is not (quite). It's called Synaptica because the repeated motif reminded me of synapses, where some of them have a connective spark at the center. The pattern is also reminiscent of Native American weavings, such as Navajo rugs with their geometric motifs. Hepdragon Fire illustrates a hidden asymmetric fractal embedded in a triangle derived from the regular heptagon (seven-sided polygon). McKenna first created/discovered the Hepdragon in 1984. The first pictures were single-color plotter drawings using custom line shading to accentuate the convergence. This new version is built from thousands of similar triangles, colored to evoke the energetic, fiery, jagged skin of a dragon-like figure, rearing a self-similar head within a dark world. 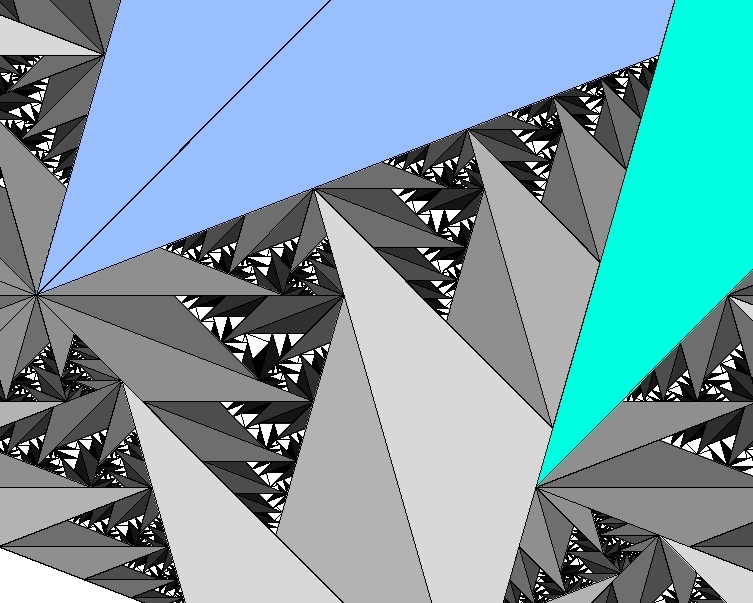 The triangles converge from both the inside and the outside to the same shape. See detail at the top of dragon head here (650K). Phiberspace is composed of over 42,000 copies, in various sizes, of a rectangle specially chosen and colored so that superpositions of them all lead the eye to see spirals upon spirals. The repeated rectangle itself is not golden, but each one is placed in a manner related to the Golden Ratio.